Aim: In this study, the decolorization of methylene blue (MB) by the electro-Fenton process using stainless steel (SS) mesh electrodes was examined. Materials and Methods: The effects of initial dye concentration, pH, and ratio of Fe: H2O2, current density, and type of electrode were studied. The kinetics of the reactions was also studied. Results: The highest removal rate 99%was obtained at pH 3 within 20 min. Kinetics experiment studies showed that removal of dye was faster at lower initial dye concentrations. The results revealed that color removal was highest at a Fe2+:H2O2 ratio of 1:4. An increase in current density resulted in an increase in oxidation rate and faster removal of color. The results demonstrated that increasing the size of the mesh pores led to an increase in the percentage of dye removal. The highest removal percentage (94.5%) was observed in 25 min with a mesh 2 electrode. The constant rate of dye removal on steel mesh 2 was 6.6 times higher than a steel plate. Energy consumed in this state was = 1.6 kWh/m3, compared to 2.6 kWh/m3 under other conditions. Conclusion: Using SS mesh electrodes was very effective in color removal for MB under optimal conditions. The present study showed that increasing the steel mesh size improved the conditions for color removal and reduced the energy consumption. Therefore, it is suggested that steel mesh be used as an electrode for electrochemical processes. Aim: The aim of this study was to investigate the degradation of an azo dye, reactive red 198 (RR198), by ozone, H2O2/O3, and persulfate from aqueous solutions. Materials and Methods: The application of several advanced oxidation processes including single ozonation, O3/H2O2, and persulfate for degradation of RR198 at concentration of 200 mg/L was investigated. The effect of various parameters including pH, H2O2, persulfate doses, and temperature was studied on the degradation of RR198 from aqueous solutions. In addition, the effects of these processes on biodegradability of RR198 were evaluated. Results: The results showed that the degradation rate was increased by increasing H2O2 concentration. The optimum H2O2 concentration was obtained in the range of 0.03 mol/L at dye concentration of 200 mg/L. Alkaline pH, higher temperature, and persulfate dose (12 mM) were favored in dye and COD removal. Moreover, compared with ozone and peroxone, the persulfate oxidation could achieve a higher color and COD removal at the same reaction time. Persulfate has greater potential to improve the biodegradability of RR198 solution than ozone and ozone/H2O2 process. Biochemical oxygen demand/COD ratio of the dye solution treated by persulfate, ozone/H2O2, and ozone at reaction time 40 min was 0.73, 0.63, and 0.59, respectively. Conclusion: These findings show that oxidation by persulfate is a promising alternative for the treatment of RR198 containing solution as a recalcitrant pollutant. Aims: The purpose of this study was to investigate adsorption isotherms of removing bisphenol A (BPA) from aqueous solutions using magnetic nanoparticles Fe3O4 and SiO2. BPA is an endocrine disrupting chemical that has caused great concern because of its potential risk to human health. Materials and Methods: The combined of magnetic nanoparticles Fe3O4 and SiO2 were applied to remove BPA from aqueous solution at a dose of 2 g/L. Isotherm Fitting Tool software was used for isotherm study in contact time 20 min, the initial concentration of BPA 0–10 (interval 1 mg/L), and pH 5. Results: The maximum adsorption efficiency was found to be 55%. The results of our experiments showed that maximum adsorption efficiency was achieved at t = 20 min and pH 5. Conclusion: The isotherm study showed that Langmuir isotherm described the equilibrium adsorption data better than other isotherms alternative. Aims: Present study was done by using upflow anaerobic sludge blanket (UASB) reactor to investigate the effect of influent chemical oxygen demand (COD) and organic load rate on the formation of anaerobic granules in wastewater treatment. 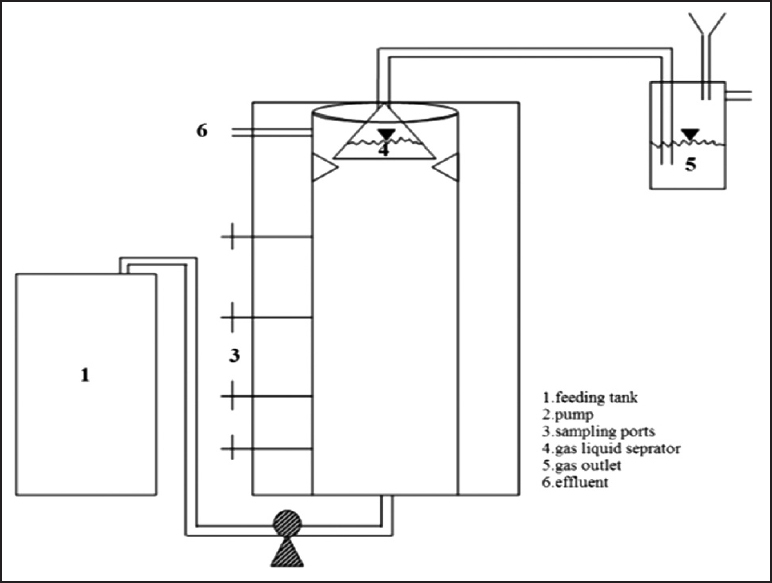 Martials and Methods: Upflow anaerobic sludge blanket reactor with working volume 30 L was studied using actual slaughterhouse wastewater at a hydraulic retention time of 1.24 d and at temperatures in the range of 35°C ± 0.5°C for 320 days. The inoculum was extracted from the anaerobic digester of municipal sewage treatment plant, and the UASB reactor was filled with 8 L of sludge. Results: The results indicated that under the optimal conditions, about 94.6% of COD could be effectively removed from slaughterhouse wastewater with the UASB. The highest and lowest COD removal efficiency was 40.5 and 94.6% corresponding to influent COD of 1266.8 and 1222.2 mg/L, respectively. The fluctuation of solution pH in UASB operation was in the range of 6.68-8.03. The average of solution pH was 7.46 ± 0.36. The solution pH was gradually improved with UASB operation. Different granule sizes coexisted in the UASB reactor, but granules with the size of 1-3 mm were predominant. The maximum observed size of anaerobic granule was 7 mm. Conclusion: Application of slaughterhouse wastewater as feed wastewater demonstrated that the slaughterhouse wastewater to be more effective in promoting the formation of anaerobic granules and granule size in UASB reactor. Aims: The quantity, composition and physiochemical characteristics of wastes are important factors in selecting an appropriate treatment method. Having knowledge about the current status of medical wastes in any region is necessary for the establishment of effective medical waste management. Martials and Methods: In this field study, official data obtained from the national statistical center were used. The statistical population for sampling and physical analysis includes two hospitals and five health-care centers, selected randomly, and WHO standard procedures were followed for wastes segregation. Results: Based on data obtained, 1335 kg of medical wastes is daily generated in Gachsaran County of which 563 kg are infected and 772 kg are noninfected. A minor part of medical wastes are incinerated or delivered to the municipality untreated. However, the major part is hydroclaved. The largest medical center in the region is Shahid Rajaei Hospital located in Dogonbadan city and infected wastes from the whole region are sent to this center to be hydroclaved. Conclusion: In conclusion, the quantity of infected wastes in the region is higher when compared to other cities in Iran. The high quantity of infected wastes may be a result of poor separation of infected and noninfected wastes by personnel due to lack of required knowledge. Aims: In the present study, a risk assessment for growth of Clostridium botulinum in model seafood deli salads was performed along with the effect of growth of resident microbes on the intrinsic and extrinsic properties of the product. Furthermore, high hydrostatic pressure (HHP) was applied to induce the germination of the surrogate spores. Materials and Methods: Five batches of seafood deli salads were stored at 4°C for up to 42 days, with samples being withdrawn periodically for microbial and chemical analysis. The extrinsic (oxygen content of the headspace) and intrinsic (redox potential, pH, and water activity) properties were determined along with microbial counts (total viable counts [TVCs], yeast and mold, lactic acid bacteria) over the product shelf-life. 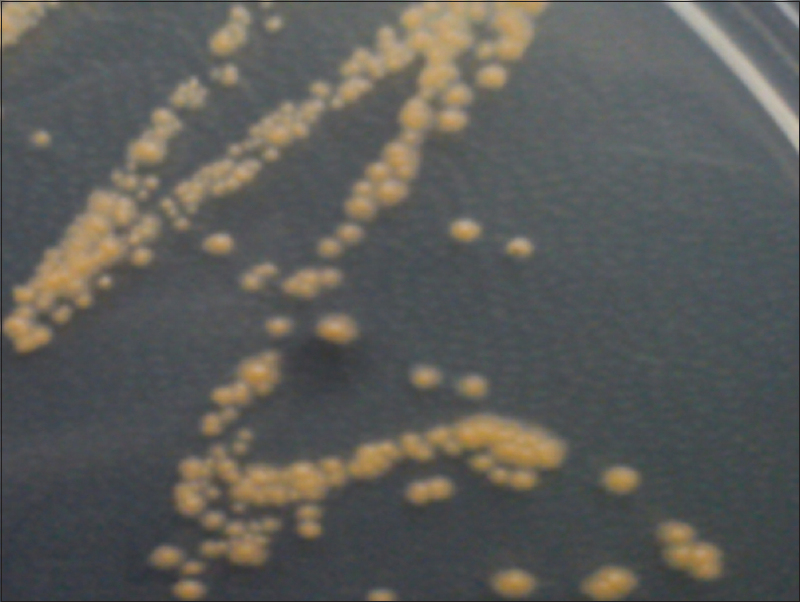 The data generated were then uploaded into a predictive model, and the potential growth of C. botulinum was assessed under different storage conditions. Furthermore, product inoculated with Bacillus atrophaeus was pressure treated at 400, 500, and 600 MPa for 1, 2, and 3 min at 20°C. Results: From analysis of the deli salads during storage at 4°C, the TVC remained below 2 log colony forming unit (CFU)/g with no lactic acid bacteria being detected. The yeast and mold count progressively increased during the storage period attaining 6 log CFU/g at the end of the 45-day storage period. There was no change in the pH and oxidation-reduction potential of the deli salads during storage. 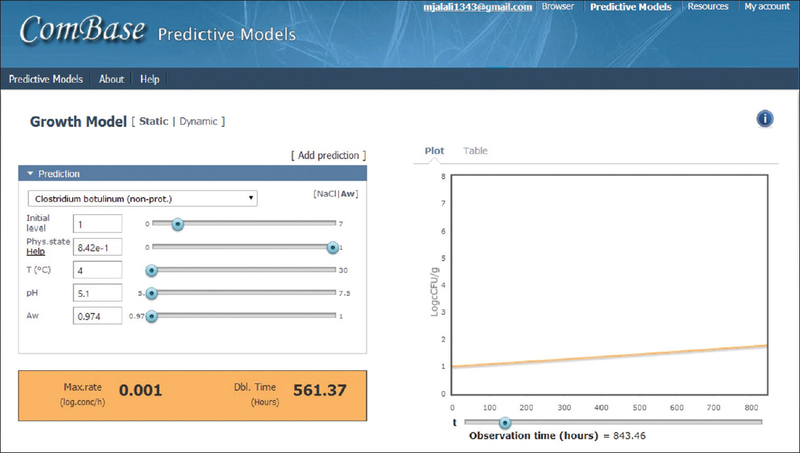 Predictive model indicated that in storage at 4°C and pH 5.1 and a water activity of 0.974, the generation time was 561.37 h. Only one log spore germination induction was observed when HHP treatment was performed at 600 MPa for 3 min. Conclusions: From predictive modeling, it was determined that based on the intrinsic and extrinsic factors of stored deli salad, the growth of C. botulinum was unlikely. In addition, the application of HHP did not significantly induce germination of the surrogate spores. Aims: In this research, application of fishery wastes as locally available, cheap, eco-friendly, non-toxicity, reusable, abundant biodegradable resources and highly efficient adsorbent was studied for Direct Blue-86 (DB-86) removal from aqueous solution. 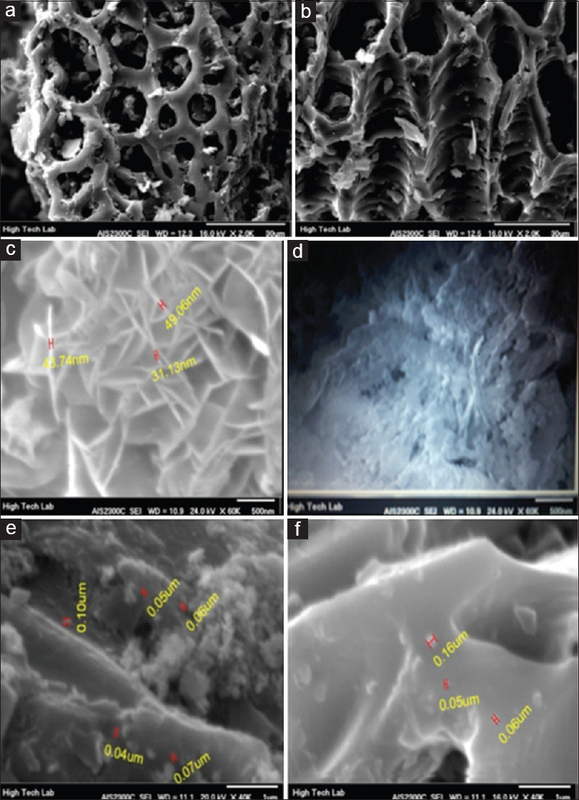 Materials and Methods: Comparison of the adsorption of DB-86 by chitosan produced from three different fishery wastes (shrimp, crab and squid collected from Persian Gulf) has been investigated. Effects of adsorbent dosage, pH, flow rate, ionic strength, interfering ions and dyes were evaluated. Results: The results indicated that maximum removal of dye (~ 100%) was obtained by passing 100 mL of DB-86 (50 mg L-1, pH=2) through a column containing 0.5 g chitosan by using continuous method (fixed-bed) at room temperature (25 ± 2 °C). 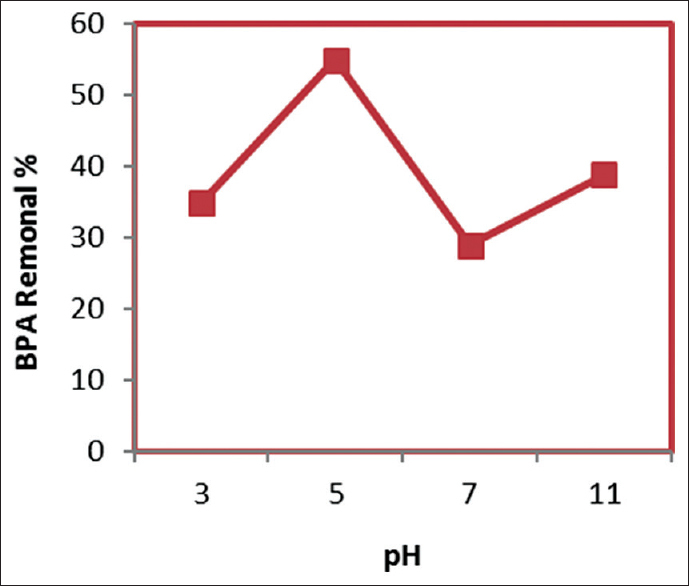 Maximum desorption of 72% was achieved at alkaline medium (pH=13.5). It was shown that equilibrium isotherm could be fitted by the Langmuir equation. The maximum adsorption of chitosan (qm) and the energy of adsorption were calculated as nearly 60 mg/g and 3.6 mg-1, respectively. Conclusion: Chitosan was successfully used for removal of DB-86 from spiked Karoon River sample and the effluent of Pars Paper Factory, a local pulp and paper factory in Ahvaz. Results represent of three replicated experiments. Aims: This research was done to assess the dechlorination and destruction of polychlorinated biphenyls (PCBs) in real-waste transformer oil via microwave (MW) radiation. Materials and Methods: The influence of MW power, reaction time, polyethylene glycol, zero-valent iron powder, sodium hydroxide (NaOH), and water (H 2 O) were investigated on the dechlorination and destruction efficiency of PCBs in real-waste transformer oil under MW radiation. Results: The findings show that polyethylene glycol and NaOH have great influence on destruction of PCBs. However, iron (Fe) did not have any influence, and H 2 O decreased the destruction efficiency of PCBs. Moreover, experimental data showed that with optimum amount of variables [ie, polyethylene glycol (PEG) = 5.4 g, NaOH = 1.13g, Fe = 0.6g, H 2 O = 0.8 mL, and MW power of 800 W], more than 99.9% of PCBs were destructed at reaction time of 6 min. Furthermore, destruction of PCBs in the absence of water increased up to 100% after 6 min. Conclusion: Accordingly, results showed that MW radiation and reactants (PEG and NaOH) were very important factors for the destruction of PCBs from real-waste transformer oil. Aims: In this study, the removal of nitrate was investigated using nanocrystalline cellulose (NCC) extracted from sugarcane bagasse. Materials and Methods: NCC was extracted by acid hydrolysis of bagasse at 40°C for 45 min and then used as an absorbent for the removal of nitrate. The properties of absorbent were evaluated by atomic force microscopy and dynamic light scattering. The effect of various parameters including pH, initial concentration of nitrate, adsorbent dose, and exposure time was investigated on the removal of nitrate. Results: NCC was obtained in a diameter and length of <14.7 and 500 nm, respectively. Optimal conditions for removal of nitrate were determined in the initial nitrate concentration, adsorbent dose, pH, and exposure time of 100 mg/L, 6, 3 g/L, and 100 min, respectively. In optimal conditions, the maximum adsorption of nitrate was 8.33 mg/g. Conclusion: The highest efficiency of nitrate removal at pH, 6 was obtained as 25%. The results showed that the NCC, extracted from bagasse, could be used as a very effective adsorbent to remove nitrate from water and wastewater resources. Aims: The purpose of this study is to investigate the zinc (Zn) and nickel (Ni) removal from aqueous solution by coagulation-flocculation using polyaluminum chloride (PACl) and chitosan (CS) biopolymer. Materials and Methods: This study was a laboratory scale experiment, which used PACl and CS to remove Zn and Ni with concentrations 3-100 mg/L from aqueous solutions. Jar test was used to compare the Zn and Ni removal efficiencies of the chemical treatment options using PACl and CS. The dosages used for PACl ranged from 5 to 100 mg/L whereas CS dosages varied between 5 and 75 mg/L. Results: The results showed that optimum coagulant doses and pH were found at 50-100 mg/L and 11 for PACl and 20-75 mg/L and 11 for CS, respectively, when CS added with PACl led to a better removal efficiency of the metals (more of 99%). In mixed aqueous solution, the presence of Zn caused increase of Ni removal efficiency and the presence of Ni caused decrease of Zn removal efficacy. Conclusion: The results of this study showed that CS had higher removal efficiency than PACl for removal of Zn and Ni, and also CS as a coagulant aid led to increasing in metal removal. Aims: The purpose of this study was to evaluate ergonomic assessment MSDs risk in computer users with Rapid Upper Limb Assessment (RULA) method and Nordic questionnaire. Materials and Methods: This cross-sectional study was conducted on 96 computer users in computer sites, Isfahan University of Medical Sciences. The data were analyzed using test SPSS 20 and descriptive statistics and ANOVA test. Data collection tool was Nordic questionnaire and checklist RULA. Results: By Nordic questionnaire, the results showed that MSDs prevalence in computer users were, in the neck (54.9%), back (53.1%), and elbow (43.2%) more than in other parts of the body. Based on the level of risk, RULA was 24 individuals in an area of low risk, 41 individuals area of caution, and 31 individuals in the area hazard. MSDs prevalence was in women more than men. Furthermore, ANOVA test showed that there is direct and significant correlation between age and work experience with a final score RULA (P < 0.001). Conclusion: This study result showed that frequency of musculoskeletal problems in the neck, back, elbow, and wrist was generally high among our subjects, and ergonomic interventions such as computer workstation redesign, users educate about ergonomic principles computer with work, reduced working hours in computers with work must be carried out. Aims: The present study was carried out to evaluate the production of eco-friendly and environmentally bio-fertilizer from a mixture of food waste (FW) and rice bran (RB). Materials and Methods: The various mixtures of RB and FW (1:1, 1:2, 1:3, and 1:5) were prepared and spread in Diy beds for 20 days. After that, the raw compost was poured in four containers beds contains 100 adult earthworms Eisenia foetida for 30 days. Physical and chemical parameters including temperature, humidity, carbon to nitrogen (C/N) ratio, and pH were monitored. Results: The obtained results showed that at the first of composting process, the temperature was sharply increased and after that dropped and reached to the ambient temperature. The C/N ratio was decreased in studied Diy beds during preparing and vermicompost processes. The averages of C/N ratios in the raw FW and RB at mixing ratios of 1:1, 1:2, 1:3, and 1:5 were 45.35, 38.43, 35.3, and 32.11, respectively. The C/N ratios in the vermicompost were reduced to 20.85, 18.3, 16.86, and 15.16, respectively. Conclusion: The results of this study showed that composting and vermicomposting process can be used as a potential tool for bio convert rice bran and food waste. However, it is suggested that the rice bran can be amended with food waste to ensure better quality of vermicompost. Aims: The aim of this study was to evaluate a membrane bioreactor (MBR) system for optimization effluent quality by feeding of the influent (raw wastewater and anaerobic reactor effluent) in Isfahan - Mourchekurt Industrial Estate Centralized Wastewater Treatment Plant. Materials and Methods: The MBR was equipped with two flat sheets membrane with 0.2 μm pore size, were operated in parallel style and feed simultaneously with raw industrial wastewater (MBR1) and anaerobic reactor effluent (MBR2). The average organic loading rates in two reactors were 1.37 and 0.52 (kg chemical oxygen demand [COD]/m 3 .day), respectively. All analyses were implemented according to the standard methods procedure. Results: The average concentration of COD was lower than 100 mg/L and 50 mg/L in both reactor effluent, respectively, and it was <30 mg/L for biological oxygen demand (BOD 5 ) in both reactors. In addition, the average turbidity, COD, BOD 5 and total suspended solid removal were higher than 92%. In both reactors effluent, average microbial indicators contamination were >1000 MPN/100 mL for MBR1 and these were <1000 MPN/100 mL for MBR2. During the operation flux reduction in MBR1 was more than MBR2. Conclusion: The MBR technology was used to treat the combined industrial wastewater was efficient, and its effluent can be perfectly used for water reuse. The MBR performance was improved by applying an anaerobic pretreatment unit. Aims: The sonoelectrochemical mineralization of the synthetic aqueous solution of the perfluorooctanoic acid (PFOA) on Ti/PbO 2 anode was investigated using the response surface methodology based on a central composite design (CCD). Materials and Methods: The CCD was performed using three different variables such as current density (CD) (mA/cm 2 ), pH, and supporting electrolyte (EL) concentration (mM). The total organic carbon (TOC) removal was determined as an indicator of PFOA mineralization. 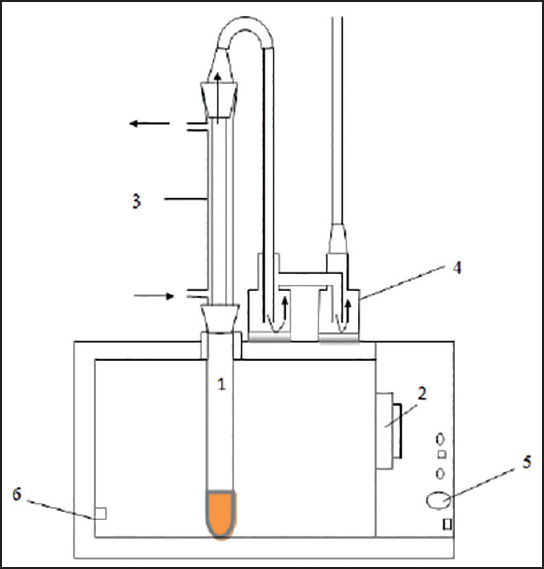 A Shimadzu TOC analyzer was used to measure the TOC of the samples. The Ti/PbO 2 electrode was prepared using the electrochemical deposition method. In order to enhance the electrochemical mineralization, ultrasonic (US) radiation was used. The US frequency was 20 kHz. Results: The optimum conditions for PFOA mineralization in synthetic solution were EL concentration of 94 mM, pH of 2, and CD of 83.64 mA/cm 2 , which resulted in complete TOC removal. The results indicated that the most effective factor for PFOA mineralization was CD. Besides, the TOC removal efficiency significantly increased with increasing CD. Conclusions: Under optimum conditions, the mineralization of PFOA was almost completed after 90 min of sonoelectrolysis. Therefore, sonoelectrolysis was found to be a more effective technique for mineralization of an environmentally persistent compound. Aims: The purpose of the present work was to consider the effect of different samples thicknesses on the acoustic absorption coefficient. Materials and Methods: An impedance tube was built with two microphones accordance to ISO-10534 and the American Society for Testing Materials-E1050 standards. For the measurement of absorption, the study was carried for 25 and 30 mm thicknesses of closed cell polyurethane foam, polystyrene, polyvinyl chloride (PVC), rubber, mineral wool, carpet, and glass samples. Measurements were performed by impedance tube and VA-lab4 software. Results: In carpet and mineral wool with more thickness, the absorption was increased but, the carpet with less thickness showed more sound absorption in the frequency range of 1500-3600 Hz. The peak of the absorption coefficient of 25 mm glass was 0.36 that the amount was reduced to 0.2 in the 30 mm thickness. Furthermore, the difference between the peak absorption of two thicknesses in polystyrene sample was equal to 0.29. In fact, polystyrene with less thickness had better sound absorption. The same situation was happened for glass in frequencies of below 4500 Hz with less thickness. Conclusion: Incident sound energy, which is not absorbed, must be reflected, transmitted, or dissipated. The porous materials had a higher absorption coefficient. Carpet and mineral wool samples had the highest absorption coefficient, but the materials such as polyurethane foam, PVC, and rubber had lower sound absorption. Aims: In present study, the mass transfer-reaction kinetic parameters of nitric oxide (NO) removal by ultraviolet (UV)/H 2 O 2 process in a bubble column reactor in the presence of SO 2 are calculated. Materials and Methods: The mass balance equation for NO through a layer thickness of δ, under the steady state condition is solved, and NO absorption rate is calculated. The value of rate constants and Ha numbers are obtained based on experimental data under different conditions. Results: The calculations indicate that the values of Ha number are >3. The values of rate constants (k obs) are fitted to some empirical equations for different operating conditions. It is observed that the value of k obs increases with an increase in H 2 O 2 concentration and UV radiation intensity while it decreases with an increase in NO and SO 2 inlet concentrations. The values of rate constants are in order of 10−5 , expect for SO 2 , which are in order of 10−7 . The results reveal that there is a good agreement between calculated and experimental values where the maximum absolute error is 16.18% related to UV light intensities between 0 and 0.012 W/m 3 . Conclusion: The obtained values of Ha numbers under different condition confirm that the absorption process of gas in the liquid phase is a fast reaction. The maximum error values resulted from a comparison between the calculated NO absorption rates and the experimental ones are acceptable. Aims: This research was conducted to measure the concentration of asbestos fibers in the ambient air of high traffic areas of Isfahan and to evaluate their spatio-temporal variation during summer 2015. 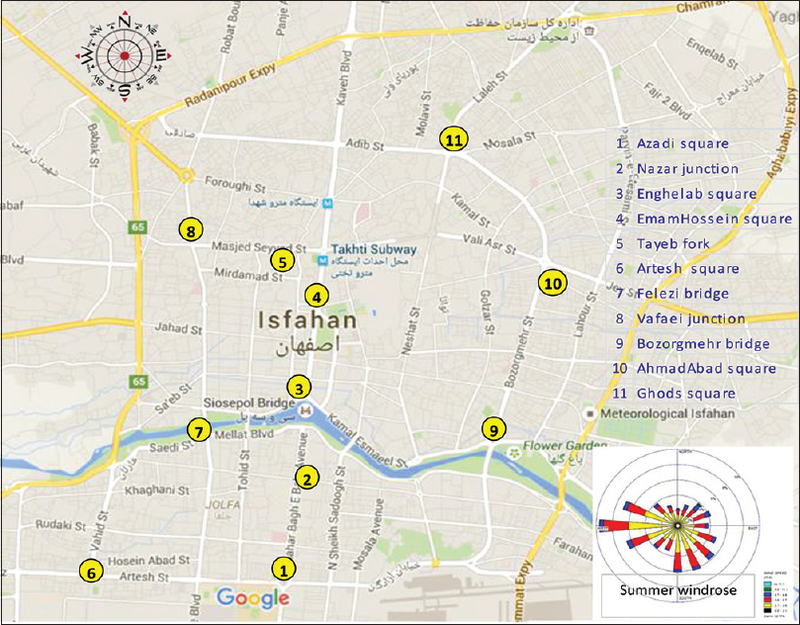 Materials and Methods: Air samples were collected from eleven points covering traffic areas of the Isfahan city including Enghelab square, Azadi square, Bozorgmehr bridge, Ghods square, Ahmedabad square, Artesh square, Emam Hossein square, Nazar junction, Vafaei junction, Felezzi bridge, and Tayyeb fork during 3 months of summer 2015. Scanning electron microscope (SEM) coupled to an energy dispersive X-ray system was utilized to count and identify the asbestos fibers. Results: Seasonal average concentration of airborne asbestos fibers in the studied region was 10.04 ± 4.90 SEM f/l. The results of this study showed that the highest concentration of asbestos fibers was measured in Azadi square (18.08 ± 3.863 SEM f/l) and that the lowest was found in Nazar junction(3.92 ± 1.749 SEM f/l). There was a significant correlation between the concentration of asbestos fibers and atmospheric temperature and humidity (P < 0.05). The mean concentration in September was higher than August and July (11.08 ± 4.66). Conclusion: Heavy traffic in the dense areas of the city, and topographical and meteorological features of the city have a major contribution in asbestos fiber emission which resulted in its exceeded levels from the WHO guideline (2.2 SEM f/l). Therefore, effective strategies such as traffic management, industrial movement, and products replacement can be effective in reducing airborne asbestoses fibers concentrations. 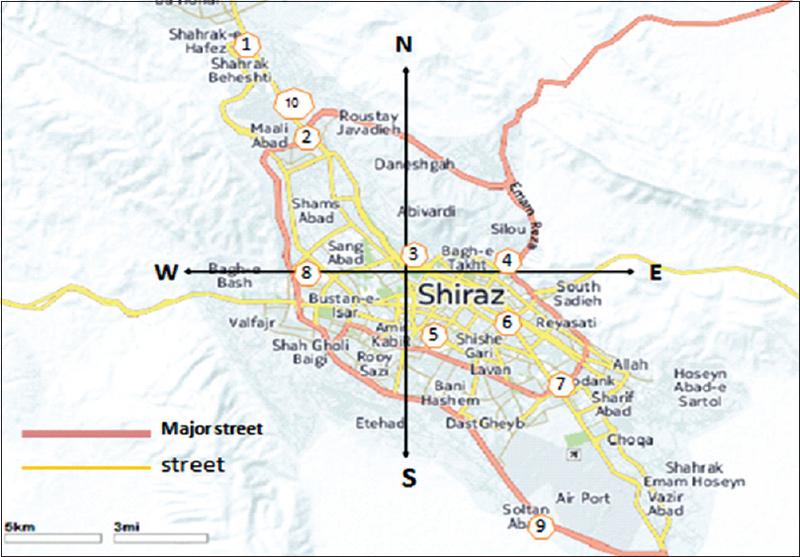 Aims: Levels of asbestos fibers in ambient air of dense areas of Shiraz, Iran, were monitored in winter 2014. Materials and Methods: Sampling was carried out by directing air flow to a mixed cellulose ester membrane filter mounted on an open-faced filter holder using a low flow sampling pump. Fiber counting on the filters was conducted using both phase contrast microscopy (PCM) method to determine total fibers and scanning electron microscopy (SEM) method to identify nonasbestos from asbestos fibers. Results: The average concentration of asbestos fibers in the ambient air of the study in different areas of Shiraz were 1.18 ± 0.28 PCM f/L and 13.64 ± 2.87 SEM f/L, in which a maximum level was measured in Valiasr square (1.89 ± 0.54 PCM f/L [20.37 ± 5.55 SEM f/L]), and that of in Moallem square was in minimum (1.05 ± 0.47 PCM f/L [12.24 ± 3.04 SEM f/L]). Conclusions: The averages of asbestos fibers in all sampling points were higher than the WHO suggested standards for ambient air (0.05 PCM f/L, 2.2 SEM f/L). This may be attributed to the frequent occurrence of heavy traffic, the existence of relevant industries in and around the city, and the topographic characteristics of the city. Therefore, immediate courses of action such as product substitution, traffic smoothing, and industrial sites relocating should be taken to eliminate asbestos fibers emission. Aims: In this study, the adsorption capacity of dried anaerobic digested sludge (DADS) and dried activated sludge (DAS) for the removal of 4-chlorophenol (4-CP) from aqueous solutions was evaluated. 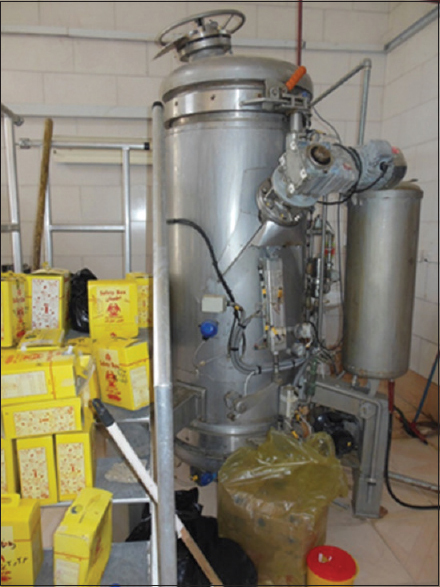 Materials and Methods: Both anaerobic digested sludge and activated sludge were collected from a south municipal wastewater treatment plant in Isfahan. Batch biosorption experiments were carried out to investigate the effects of solution pH, contact time, biosorbent dosage and initial concentration of 4-CP. The residual concentration of 4-CP was analyzed by colorimetry method. Isotherms and kinetic equations were applied to study kinetic and equilibrium of adsorption. Results: Results indicated that, DAS have higher removal potential in comparison with DADS. The optimum pH was detected to be 3 for DADS and 4 for DAS. By increasing contact time and biosorbent dosage, removal efficiency of 4-CP increased for both biosorbents. Furthermore, a decreasing trend was observed when initial concentrations were increased. The equilibrium time for DAS was 2.5 h and for DADS was 4 h. The maximum adsorption capacity were found 1.67 mg/g for DAS and 0.93 mg/g for DADS. The 4-CP removal equilibrium isotherm was modeled by Freundlich equation. Kinetic studies suggested that pseudo-first-order model for DADS and second order for DAS were the best choices to describe biosorption behavior. Conclusion: According to the present study, DAS, have better efficiency for the removal of 4-CP in comparisons with DADS. Aims: The aim of this study was the evaluation of adsorption kinetics and equilibrium of reactive blue 19 dyes from textile synthetic wastewater by pomegranate seed powder. Materials and Methods: This study is an experimental research, which was performed in laboratory scale. In this study, the parameters such as adsorbent dose, pH and retention time, initial concentration of dye and agitation rate have been investigated. After washing and boiling of pomegranate seeds for 2 h, they dried, milled and finally pulverized by standard ASTM sieves (40-100 mesh). Maximum adsorption wave length (λmax ) by spectrophotometer ultra violet/visible (model SP-3000 Plus) 592 nm was determined. The Langmuir, Freundlich and Temkin isotherm models and the pseudo-first-order and pseudo-second-order kinetic models were analyzed. Results: According to results, the removal efficiency with adsorbent dose, retention time and agitation rate has a direct relation. Maximum adsorption occurred in the first 60 min. 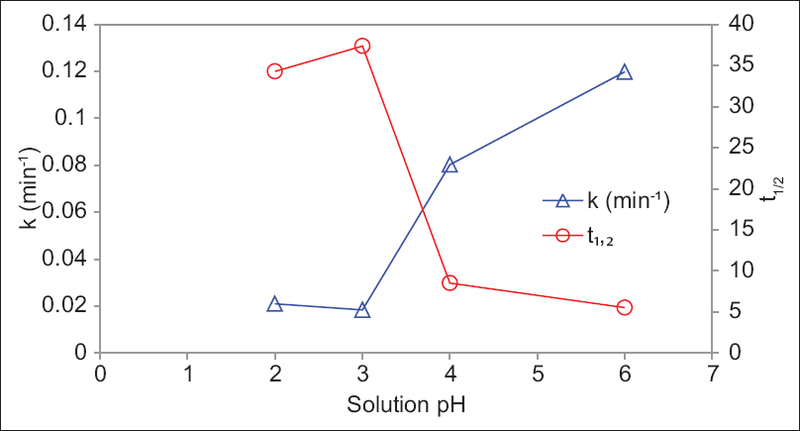 The removal efficiency with initial concentration of dye and pH of solution has indirect relation. The Freundlich isotherm fits the experimental data better than the other isotherms. It was recognized that the adsorption followed by pseudo-second-order model (R2 > 0.99). Conclusion: Based on the results, pomegranate seeds as a new natural sorbent can be used in removal of dye and other environmental pollutants with desirable absorption capacity. Aims: The objective of this research was an evaluation of hand-held tools vibration acceleration such as circular saw and drill transmitted to operator's and also to determine the role of glove in vibration reduction of those tools. Materials and Methods: In this study, Bruel and Kjaer Vibration meter with a model of 2231 and its analyzer, 2522, along three types of gloves have been used. Accelerometer transducer installed according to International Standard Organization (ISO) 5349:1-2 standards in the case of the operator handles the hand-held tool. In next step, the transducer was placed inside the glove. Results: The results show the most accelerated vibration in axis Y for circular saw while working on Plexiglas. All of the used gloves show a reduction of vibration transmission from tools to hands. Glove of C grouped had a reduction of vibration less than two other groups. Conclusion: Based on ISO 5349-1, 10% of workers who are working with circular saw and drill without using glove will be affiliated to white finger after about 7-12 years. As a whole, the results showed that the anti-vibration gloves should be tested in real conditions before using them. Aims: In this study, distilled water and dimethylformamid (DMF), an organic solvent, have been compared in different characteristics to be used as the best solvent during EPD. Materials and Methods: Electrical conductivity (EC) of both solutions was compared by dissolving electrolyte and measuring the EC. Ability of dispersion was determined after sonication in different times. Distilled water, DMF and two mixtures of them were utilized in EPD process and in deposition time of 1-5 min. The electrode weight was measured before and after the EPD and the deposit rate was estimated. Results: Among the used solvents, DMF caused a better yield (0.4 mg/cm 2 ) at the optimum deposition time of 4 min. Though it did not have the ability of dissolving electrolyte and could not make an electrical field during EPD; it did not cause the electrode's oxidation. Distilled water and mixtures with water resulted in electrode oxidation with no deposition. Their yield was zero or less which indicated the electrodes oxidation. € According to the results, for having a good and stable dispersion through sonication, making an electrode with a homogeneous deposition via EPD process, preventing of electrode's oxidation, and better temperature control DMF is recommended. Aims: The present study reports the antibacterial efficiency of starch-stabilized nano scale zero-valent iron (S-NZVI) particles on Escherichia coli. Materials and Methods: NZVI was synthesized using NaBH 4 and FeSO 4 .7H 2 O, and characterized by scanning electron microscopy, as well as X-ray diffraction. The effects of concentration, contact time, dissolved oxygen, and stabilization were tested. E. coli was determined by the pour plate method. Results: The results revealed that the complete inactivation (100%) of E. coli was occurred at using 100 mg/l of NZVI after 30 min under anaerobic condition. The inactivation efficiency was decreased in an aerobic condition. When NZVI concentration increased to 500 and 1000 mg/L, complete inactivation was achieved under both anaerobic and aerobic condition. In general, E. coli inactivation efficiency using NZVI was strongly dependent on the contact time and the concentration of NZVI particles with its maximum efficiency at 500 mg/L within 120 min. Stabilization-NZVI by starch did not improve its bactericidal activity and the inactivation of E. coli by stabilized nanoparticles required higher concentration compared to that by nonstabilized nanoparticles. Conclusion: The present study showed that nonstabilized Fe 0 nanoparticles have higher bactericidal efficiency than that of S-NZVI. 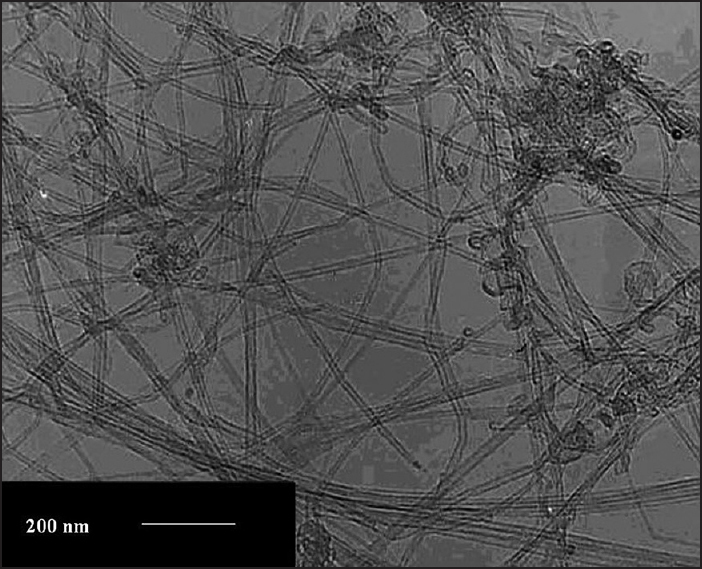 This investigation also suggests that NZVI can be used as an effective and strong agent for antimicrobial applications. Aims: In this study, which was done in Persian Gulf Mining and Metal Industries Special Economic Zone, the efficiency of "theory of planned behavior" in training the correct principles of manual material handling was investigated. Materials and Methods: To perform this semi-experimental study, based on the theory of planned behavior and method of manual material handling required questionnaires were prepared. After preliminary studies and determining the reliability and validity of questionnaires, the appropriate study population was selected from the workers, and the questionnaires were filled up through interviews. Results: The results showed that subjective norms (safety factor = 0.51, P < 0.001) are the predictors of behavior intention (performing manual material handling correctly) and behavioral control, as well as behavioral intention, are appropriate predictors for behavior change. Conclusion: This study confirms the efficiency of the theory of planned behavior in modifying the workers' manual material handling behavior. But since all constructs of the theory of planned behavior could not predict the behavioral intention for correct manual material handling, it can be concluded that for changing the behavioral intention, other theories also should be taken into consideration.